This review was first published in the Boston Review. It is about 6 printed pages long. It is copyright © Forrest Gander and Jacket magazine 2007. Cars were approaching, and I had to hurry to the other side of the crosswalk. When I glanced back, I saw that my interlocutor had not been a mounted policeman at all. By some reductive, metaphoric, and blanket error, I had mistaken a cloud of dust, whisked up by the May wind, for a man on horse. Even as I watched, baffled, and the apparition began to dissipate, a kind of twitch went through it again and the face of the policeman reappeared, eerily familiar — was it Martin Earl? — before it was blown apart forever by a herd of passing Toyotas. At least, I thought to myself, quoting Ashbery from A Worldly Country, “I am in the thick/ of what I would rather be doing....” I caught the flight to Lisbon and as the plane took off, I was remembering my astonishment at how the final lines in some of Ashbery’s new poems utterly revised my readings of the poems. For instance, “One Evening, a Train” ends with the disjunctive, italicized couplet “I don’t know what her name is./ I don’t know her well.” The unanticipated implication of a character (“her”) sent me back into the poem, trying (impossibly) to recast it to accommodate the conclusion. Then I read forward and backward through the book, noticing how frequently the word “dream” appeared. I woke with a start and sprinted off the plane... in Munich. Somehow I must have slept right through the stop in Lisbon. In the men’s room at the Munich airport, the image of an anatomically precise fly is printed into the white porcelain of each urinal, down by the pink deodorizer puck. Presumably it gives men who, bored with peeing, tend to look around distractedly and then pee outside the urinal — hence the puddles we so often have to straddle — something on which to focus. Despite missing my stop, I felt at ease. 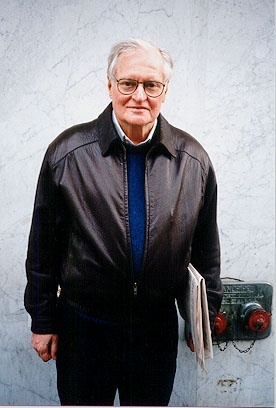 I was thinking that despite all Martin had said about Ashbery’s new demotic voice, there were a number of poems in A Worldly Country that closed in meditative propositions that were only partially, if at all, derailed by irony or lampoon. “God will find the pattern and break it,” ends one poem. Another: “There comes a time when the fleece/ fills your mouth, but there was so much left to say.” And “The Handshake, the Cough, and the Kiss” finishes with a Keatsian flourish: “the past is unredeemed,/ and all fruits are in season.” Then there is the book’s first poem, the title poem, which closes with the curious: “And just as waves are anchored to the bottom of the sea/ we must reach the shallows before God cuts us free.” I was thinking how eager I was to point out these poignant assertions of mortality to Martin Earl. Then the man standing at the urinal beside me began to mumble. I didn’t dare look over at him. I kept my eyes on the fly in the bowl. though picked out in pills of light. I had plucked that quote out of nowhere, didn’t even realize I’d memorized it until I recited it, and it was the perfect riposte. I felt enormously pleased with myself. But no one responded to my quotation. I turned my head right and left. As always, I was alone with Ashbery’s lines riffling through me. I felt a vague happiness even as another question from A Worldly Country dropped into my consciousness like a dice throw. I heard myself quote out loud, “What had happened and why?” It looked like I might be stranded in the airport for a while. I felt a little like Ricardo Reis in Saramago’s novel. At least I had a great book to read in the terminal, Ashbery’s new one, A Worldly Country. What a gorgeous cover, a painting of the city by Jane Freilicher! I wondered, vaguely, if I would ever get to Portugal. Martin Earl, Martin Earl, why was that name so familiar? Who was he, anyway?